Parade participants typically have to assemble a couple of hours before the parade starts. Then they wait. Sometimes there is judging for some of the awards, but still it is mostly a time of waiting. Spectators are not excluded from the parade assembly area. You may just walk in and start handing out tracts. People in the assembly area are typically hyped up and excited to be in the parade. 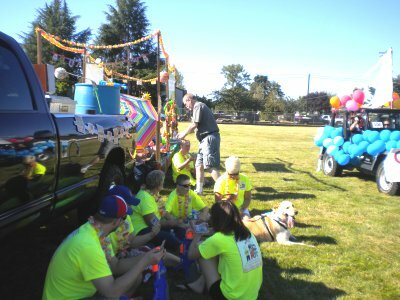 They are in conversations with friends in their group or working on their float. With people focused on the parade I've found it difficult to start conversations about the gospel. But it's a great place to hand out tracts. The million dollar bill is a good tract to use in the parade assembly area. Wander around the assembly area. Smile. Have a good time. Compliment people on their floats, cars, animals, costumes, etc. Have fun. And offer a tract to everyone. The people in the parade need your love. Don't forget them. They also need to know about the gospel.